Please find below classifieds in category Clothing for sale, accessories category in New York City. Please use the form above to refine your search in Clothing for sale, accessories in New York City. If you can not find what you need in New York City please add your wanted ad to let sellers contact you. If you want to keep your contact info confidential enter only your email address so you will receive offers into your account in our system. You can click Post a classified ad link below or the button Post classified for FREE in top right corner of this page to post your classified ad in category Clothing for sale, accessories in New York City. It is fast, easy and free to post an ad in FREEADSinUS.com. It will take you just few minutes to have the ad available on our listings. You can edit your ads any time by clicking “Edit my ads" button on top right corner of this page. 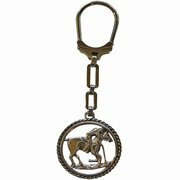 Alpaca silver polo player key ring. Measures 4.5" x 2.5" (length x width of disk) Hand crafted by Argentine Artesians in this unique and durable style key chain. https://www.piecesofargentina.com/shop-gift-items/ta8ubro713e7603qcce1ztp3x1vntf. Carpincho aka Capybara agenda / notebook, beautifully crafted by hand in Buenos Aires, Argentina. Spiral binder style designed for calendar or notepad refills. 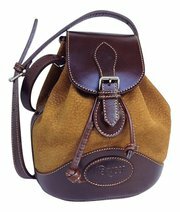 Trimmed in 100% Argentinian cowhide leather in our rich chocolate brown with zip around closure. Measures 10.5" x 8.5" x 2" (length x width x depth) Also available in black Capybara with black cowhide trim. 100% Authentic Carpincho aka Capybara hide with Argentine cowhide leather trim, crafted by the skilled hands of leather-men in Buenos Aires. This drawstring, pouch styled bag measures 10" x 6.5". Very roomy interior, fully lined and has zippered interior pocket. Front closure with leather drawstring and strong magnetic snap under buckle. Hard to find, exotic Carpincho / Capybara hide, unisex wallet in this practical tri-fold wallet design. Loads of storage in this smartly design wallet. Magnetic front closure, top bill entry, with stain fabric lining, over sized ID window with loads of credit card slots and storage compartments. Available in natural or negros (black) Carpincho hide with accenting 100% Argentinian cowhide trim or Argentine pebbled cowhide leather. 100% Genuine Carpincho / Capybara hide, trimmed in chocolate brown Argentinian cowhide briefcase. Three divided interior compartments, two zippered pockets, expandable sides, grab handle and adjustable shoulder strap. Nicely finished with front lock and key. Case measures 16" x 11 x 3" https://www. Proudly presenting our beautiful, genuine and hard to find, exotic Capybara / Carpincho hide men's billfold wallet. Trimmed with 100% genuine Argentine cowhide in a rich caramel tan color with matching top stitching. Measures 4.5" x 3.5" x .5" (length x top to bottom x thickness) Smartly designed with a flip style double sided ID window, right and left side credit card storage slots and a divided top bill entry. Heavy cowhide leather polo player wallet. 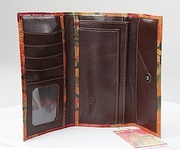 Bi-Fold style with double credit card slots and top currency entry. https://www.piecesofargentina.com/mens-wallets/polo-player-cowhide-leather-wallet-imported-argentina-ebind-28. 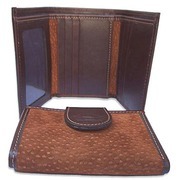 100% Fine Argentine cowhide leather wallet, available in rich chocolate brown or black. Interior features 6 credit card slots with top entry double compartment for currencies. Measures 4.25" x 3.25" when folded closed (side to side, top to bottom) Opened measurements are 8.25" x 3". 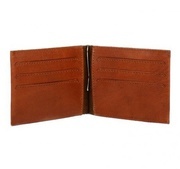 Our unisex tri-fold Capybara Carpincho & cowhide leather wallet is a simple and uncomplicated model. The interior features a large ID window, credit card slots and top entry for currency. Front snap closes wallet securely. Measures 4" x 3.5" when closed - 9" x 4" when opened. https://www. Leather business card holder in horizontal design with horse embossed front. Hand crafted of 100% Argentinian leather cowhide, imported from Argentina. https://www.piecesofargentina.com/mens-wallets/ex-rf130012-leather-business-card-case. The Ultimate Traveler man bag! Hand crafted of 100% full grain Argentinian cowhide leather, in this stunning 'distressed' mocha brown leather. 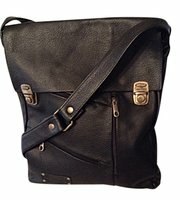 (or our smooth black stain-like leather) Measures 15" x 11" x 2" (height x width x base) with a buckle adjustable shoulder strap which extends up to 48" in length. 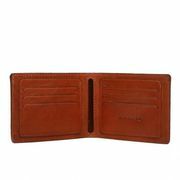 Capybara / Carpincho & Cowhide Leather Men's Wallet with double ID window. This handsome men's billfold features an interior double sided window ID section with credit card slot on both right and left sides. Top opening is lined with a divided bill entry designed to hold multiple currency sizes. 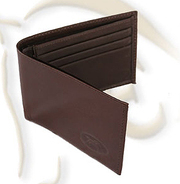 This is a dollar size wallet model, as opposed to a ‘euro’ size, measuring 3. Argentinian pebbled leather unisex wallet in this practical tri-fold wallet design. Loads of storage in this smartly design wallet. Magnetic front closure, top bill entry, with stain fabric lining, over sized ID window with loads of credit card slots and storage compartments. https://www.piecesofargentina. 100% Authentic Argentinian cowhide leather hombre, men's wallet with extra credit card flip out compartment. Top lined, currency entry which is divided into two separate compartments. A handsome, functional wallet any man would love! We have two great colors, caramel tan or black. https://www.piecesofargentina. 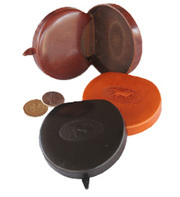 100% Genuine Cowhide Leather, Vintage Styled Pant Pocket Coin Holder. https://www.piecesofargentina.com/mens-wallets/nilk8qm7b6au430pujip9w08xz9lys. "Silk of the Sea" as Eel skin is referred too. Eel skin is 150% stronger than cowhide leather and can endure almost a lifetime of wear! Measures 4 1/4" x 3", has an ID window with a slot behind the window along with an additional top storage slot. Flip side has magnetic money clip with 3 generous credit card slots and compartment behind money clip which runs the length of wallet. Billtera Hombre Men's Authentic "Teju" lizard billfold wallet - Euro Size Our exotic skins, specialty leathers and hides are stunning and never available for long so don't hesitate or these beauties will gone soon too! 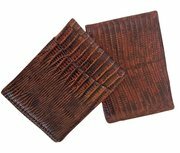 These durable "taj" or "Teju" lizard skin wallets with premium cowhide interiors make for a very handsome gift, either for you or someone else! Designed with every detail in mind, this unique model offers great features! With multiple credit cards slots on right and left sides and a top entry with a lined, silky satin fabric interior and accessing top stitching. Heavy, Durable Cowhide Leather Money Clip Wallet Men's Wallet with horse head front, money clip centered interior and cross polo mallets on rear side of wallet. Loads of credit card storage available on right and left sides. https://www.piecesofargentina.com/mens-wallets/5y8ra88aj0sl0e33kk9b7a6t85gfzy. 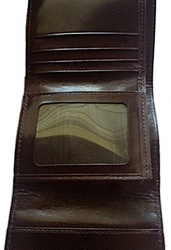 100% Genuine cowhide expandable credit card case. 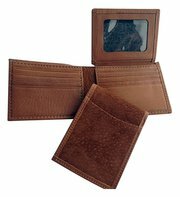 In this rich caramel color and buttery smooth cowhide has a generous expandable design to accommodate all your credit cards! Separate ID slot on rear exterior as well as interior ID window and main compartment division. Case measurements are; 4.25” x 3” and 4. Our leather 'croc' embossed bi-fold wallet measures 4” X 4.5", when folded closed & approx. 8.5" long when opened. It is suitable for dollar or European sized currencies. 100% authentic, full grain Argentinian cowhide construction inside and out! An interior with credit card slots on both right and left side and a double sided ID window insert. Crafted from the ‘best leather around the globe’, our handsome ” hair on' cowhide “ men's wallets are crafted by the skilled hands of Argentinian Artisans and imported from Buenos Aires, Argentina. Trimmed in full grain cowhide leather with a matching interior leather construction. Credit cards slots are provided on both the right and left sides of interior, with an ID window insert. 100% Authentic, genuine Carpincho Capybara Leather Billetera Hombre Men's Billfold Wallet. Features interior credit card slots, split side opening to top divided bill entry which is fully lined. This very popular design is not only functional but will keep all your contents organized! Nicely finished and trimmed with 100% Argentinian cowhide leather and contrasting top stitching. Absolutely stunning! 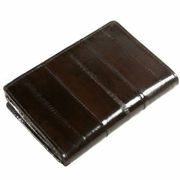 100% genuine Eel skin case designed for carrying credit cards or business cards in this handsome mahogany finish. Measures 4.25” x 2.75” when closed and 5.75” x 4.25” when opened. The interior has a large ID window slot with credit cards slots opposite it. The expandable pocket compartment will extend up to 3/4” to hold all your credit cards. Our handsome 'hair on' cowhide men's wallets are crafted by the skilled hands of Argentinian Artesanels and imported from Buenos Aires, Argentina. Trimmed in full grain cowhide leather with a matching interior leather construction. Credit cards slots are provided on both the right and left sides of interior, with a double ID window insert. Handsome, genuine Eel Skin men's bi-fold style wallet with interior spring loaded money clip. 6 credit card slots on right and left sides of interior with 2 additional compartments under each slot side. Wallet measures 4" x 3.25" (closed) A sleek, smooth design with outstanding quality Eel skin, both inside and out! Use promo code for 1/2 price shipping at checkout. Our most popular leather wallet of 100% genuine Argentinean cowhide, hand crafted and imported from Argentina. Beautifully top stitched in matching thread with an embossed running horse. Euro size construction with plenty of storage for credit cards, removable ID holder and top lined entry for currency. An outstanding wallet of eel skin crafted, making this beautiful clutch styled wallet. 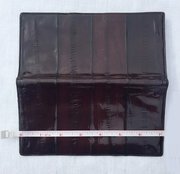 Measures 7.5" x 3.5" when folded closed and 7.5" x 7.25" when opened.Eel skin is light weight, soft, pliable and very durable! https://www.piecesofargentina.com/ladies-wallets/sw444ls57trklureny7nvzql9lmdra. Argentinean exclusive wallet! Leather floral clutch style wallet with solid cowhide interior. This model is the same as our NC-Noa/16 clutch wallet, the difference is only the interior leather. This model has a solid cowhide interior where as its sister model has a floral interior. The interior features multiple credit card slots, currency dividers and ID window. Beautiful Tri-Fold Carpincho Cowhide Wallet - Our ladies tri-fold Capybara Carpincho & cowhide leather wallet is a simple and uncomplicated model. The interior features a large ID window, credit card slots and top entry for currency. Front snap closes wallet securely. Measures 4" x 3.5" when closed - 9" x 4" when opened. 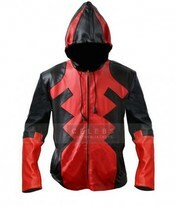 Deadpool portrays a kind of menacing attitude and this particular hooded jacket is designed in such a way that it compliments that mood and the attitude. The symbolic design of the deadpool jacket is very unconventional and also very pleasing to the eye. This Ryan Reynolds’s jacket achieves what most of the jackets fail to achieve. This is classifieds listing page in category Clothing for sale, accessories in New York City. The listings include ads for sale and wanted ads posted in New York City location on our site or sourced from Oodle.com from categories related to Clothing for sale, accessories. If you posted an ad on this page before please click "Edit my ads" button to sign in your account and edit your classified ads, check the requests sent to you from your ads contact forms or check the offers sent to your wanted offers. Clothing for sale, accessories New York City classifieds, New York City ads, New York City classified ads, garage sale New York City. Find here ads for sale, to buy and rent in New York City. Goods for sale in New York City, vehicles for sale in New York City, New York City real estate for sale, New York City property for sale, property for rent in New York City, business ads in New York City, New York City business classifieds, services in New York City, New York City services ads, jobs in New York City, pets for sale in New York City, New York City dating, New York City cars for sale.